We plan a great game on your community. Come to the random! We invite you to our Random Masters tournament. In this world you are born and have to fight for your role in the world. Anything can happen, but if you master the game, you will be able to play any role. We will tell you which god you are playing and then you will be the best! We will play completely in a land world. Join the BF Community, join the Random Masters. Maybe the Winners of the Random Masters can get a goodie. Die Gamescom 2019 und alle wichtigen Infos. startet vom 21.08 - 24.08.2019 in Köln. Wem werden wir dieses Jahr alles sehen? Schreib es ruhig unter den Kommentaren. Melde dich an für den Newsletter. Damit bleibst du immer auf dem laufenden. Items (priority #11 or "Decrease rewards or increase risks for high-level sites" based on the poll on the opinion of the community on balance): in the vanilla game, each site giving items was associated to only two "reward sets" (see the Wikia for more explanations), which means you could get Mythical items in low level sites or, vice-versa, Common items in high level sites. Getting crappy items after a tough fight could be quite frustrating, and conversely, getting very good items during early clearing could unbalance the game. v1.27 changes that by linking rewards to the site difficulty: now Mythical sites will always yield Mythical or Legendary items, while "common" sites (like Brigand Hideouts) will only yield Common items. This change was associated to a requalification of the rarity of 60+ items. Floating / Flying: several discussions indicated Floating and Flying units benefited too much from their extra mobility, without significant weaknesses and were clearly superior to non-Floating/Flying units. Debate is still ongoing on how best to deal with that but two options got enough support to be implemented: Floating units no longer have Cave Crawling automatically, so they need 4 MP underground instead of 3 MP. And Pillar of the Stylite gives additional bonus vs Flying units. Mind control and independent Regrowth units: the balance mod has introduced many changes to limit snowball through mind control, but works remain to be done. One area still needing work is independent Regrowth units, which can give a very significant advantage to players getting access to them early through mind control. v1.27 thus introduces an extra +25% upkeep for such units. This feeds into priority #4 " "Further balance 'leveling and mind-control' vs 'production'". Engineers: another long-standing work of the balance mod, Engineers have been boosted with more HP, better Flash Bomb, the ability to Build Roads... but they're still expensive to build (and thus usually require more than 1 turn to produce): v1.27 weakens them slightly in terms of damage output but makes them cheaper. Bug fixing: as usual now, this new update fixes bugs! 5 from the official game and 2 from the balance mod. Description updates: 18 imprecise or incorrect descriptions were updated, to make players' life easier, and a full relocalization for French has been included in the balance mod! Thanks to Rodmar18 for that! v1.27 comes a bit less than 3 months after v1.26 (first released on the Tournament branch of the balance mod). The goal is to keep a pace of a release every 3.5 months. Around the end of June, v1.28 should make the tactical AI a bit smarter, consolidate previous changes (e.g. related to Regrowth independent units), and bring small balance touches, like delaying the learning of Call Ancestral Spirits by AD heroes. Later, v1.29 (which should be renamed directly v1.3 if we manage to achieve its ambitious plans!!) should go much further in the AI smartening direction, make Racial Governance much more balanced and interesting, and make strategic spell casting and disjuncting much more active. - Floating does not give Cave Crawling any more (need 4 MP to move on Subterranean climate). - Trolls, Naga Slither, Naga Guardian and Naga Matriarch get "Greedy": The unit costs +25% upkeep. 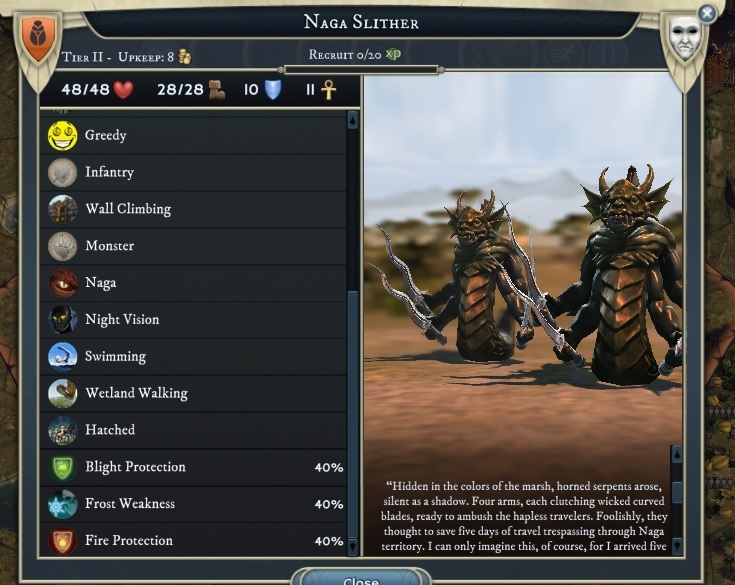 Naga Slithers, Guardians and Matriarches produced in a Naga Dwelling get “Hatched” and gets -25% upkeep, which means they cost 8 gold/turn (as before). (Untamed) Trolls and Nagas now get Greedy (+25% upkeep). The Hatchling Pool at Naga Dwellings cancels out this with Hatched (-25% upkeep) for Nagas. - Pillar of the Stylite gives an additional +1 spirit damage against Flying units.Solar Spire gives +1 fire melee damage against Flying units. - A new “Tournament” game flow is available and automatically sets up the Advanced Settings of maps (number of treasure sites, etc. and geography) based on PBEM tournament rules. 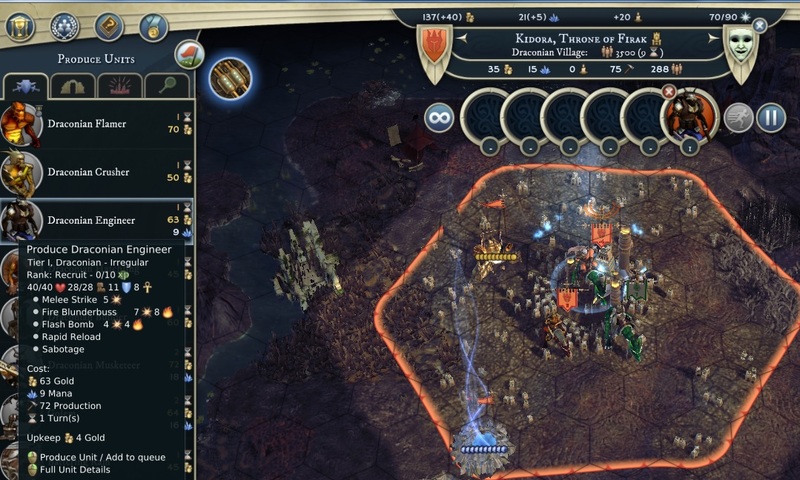 - The extra cost due to extra abilities for Engineers is now 5 gold for Projectile Resistance for Dwarves (was 11), 5 gold for Sprint for Tigrans (was 10), 5 gold for Inflict Immolation for Draconians (was 10). Finally, you can one-turn your Engineers and they're not over-priced any more! The end of the road for Engi balancing? - Rot gives Weakened to Machine and Undead it affects (was Deteriorated in the balance mod and Weakened in vanilla). The Battlefield Community invites all Dom5 players! As the balance mod matures after 2.5 years of development, this new update took some time to focus on bug fixing and improving user experience by correcting 29 incorrect or imprecise descriptions from the official version. It also refined the changes to True Resurrect brought by v1.25. v1.26 thus consolidates the role of the balance mod as an essential addition to AoW3 for all single and PBEM players seeking a better user experience and more balance. v1.26 brings about 2 changes and 5 issue fixes (1 from the base game and 4 from the mod itself). True Resurrect: v1.25 had started to rework True Resurrect, splitting it into Greater Resurrect for allied units (for 25 CP) and True Resurrect for enemy units (for 50 CP). v1.26 furthers limits the scope for abuse by aligning True Resurrect with other forms of mind-control. 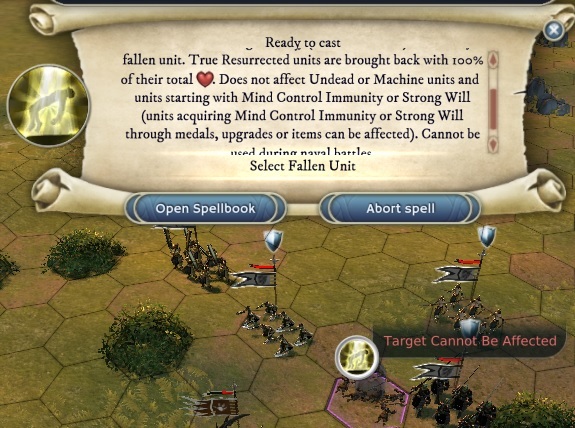 It is now impossible to take control of enemy units with "native" Mind Control Immunity or Strong Will and resurrected enemy units now get the "Mind Controlled" increased upkeep. True Resurrect cannot be used on enemy units starting with Mind Control Immunity (here a Berserker) or Strong Will. It can still be used on units like Human Knight who get Strong Will through medals or other means (due to a technical limitation). Enemy units thus acquired get +25% upkeep cost. An attempt to fix the behaviour of Twisting Roots to prevent it from affecting heroes and Leaders who gained Floating through hero upgrades and Apprentices gaining Floating through medals did not fully succeed and is delayed to later versions of the mod. v1.26 was released about 3.5 months after v1.25 on the beta branch of the balance mod, but its release on the main branch has been pushed back by a couple of months due to delays in round 1 of the 2018 PBEM 2vs2 Tournament. The pace of releases of the mod should be maintained at about 1 update every 3.5 months. In early 2019, v1.27 will deal with item reclassification (priority #11 or "Decrease rewards or increase risks for high-level sites" based on the poll on the opinion of the community on balance), some preliminary Floating/Flying balancing, and further boosts to Engineers. It is hoped that v1.28 will tackle some tactical AI issues, in particular regarding the casting of useless spells in scout wars (e.g. Great Reawakening cast in 1vs1 battle where it cannot have any effect). Work on "Further balance 'leveling and mind-control' vs 'production' (reducing XP counters for T3 and T4, boosting production classes and/or increasing upkeep further for mind-controlled units, etc.)" and "Make non-summon strategic spells more interesting" still need to be started (priorities #4 and #5 respectively). - War Anthem now give -100 morale and not -400 when resisted. 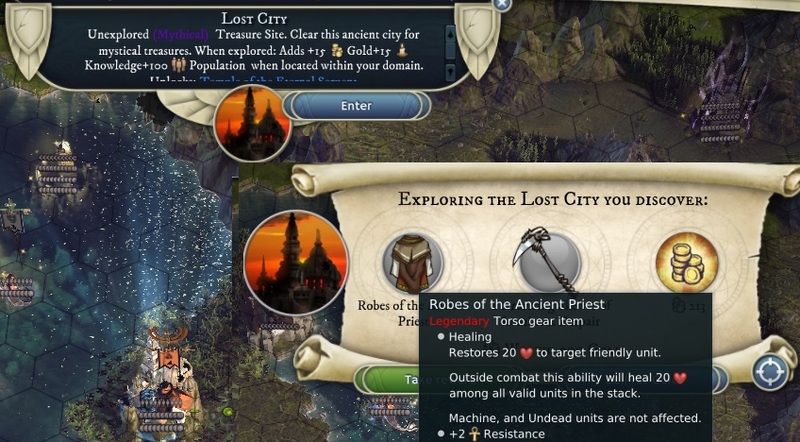 - True Resurrect cannot target the cadaver of enemy units which have Mind Control Immunity or 100% Spirit protection at Recruit (does not apply to units which acquire it through medals or buffs) and gives "Mind-controlled" to enemy units it resurrects (+25% upkeep) (Greater Resurrect, 25CP working only on allied units can still work on MCI and does not give Mind-controlled). - Kwapa starts with Swimming (was 2 free UP), Falenas starts with Fel Horse (was 2 free UP), Nashac starts with Free Movement (was 2 free UP).